On Saturday 23rd September 2017, Wilsons: FC took to the pitch for a second time in the annual Just for Kids Law, and Hodge Jones and Allen Charity 5-a-side Cup. The event was raising funds for Law, which provides advocacy, support and assistance to young people in difficulty, particularly those in trouble with the law, looked after children and those at risk of exclusion from school. Twenty teams gathered at the Rocks Lane sports centre in Chiswick and, whilst the participants were reminded that there was no right of appeal against refereeing decisions, a timely reminder of the importance of the legal profession was given by the guest speaker – former England and Surrey cricketer, Zafar Ansari. Zafar spoke of his decision to retire from cricket aged 25 in order to do something of greater benefit to others. Zafar now works as an advocate with Just for Kids Law. Competition rules allowed Wilsons, decimated by a spate of injuries, to call upon emergency loan signings. Donning navy and white shirts alongside Wilsons stars Georgios Tsigkas, Daniel Merriman and Tim Davies were friends-of-the-firm Matthew Ahluwalia and Jack Abbott. Matt is known to many through his work at the AIRE Centre and Jack joined the 2015 Wilsons trip to Calais. Wilsons were pitted against Clifford Chance in the first game in Group D. With player-manager Adam Spray absent, Merriman was in charge of tactics, which were hastily and decisively decided upon in the moments before kick-off. A tight game of few chances was set alight when Tsigkas turned inside his man on the corner of the area and, showing great composure and deft feet, took it past another defender before placing his shot past an already-committed keeper. Wilsons extended their lead not long afterwards, as Abbott unleashed a powerful shot into the net, leaving the Chance keeper rooted to the spot. Ahluwalia and Abbott had both produced assured debut performances at the back, but there were a few nervy moments for Wilsons after Chance pulled a goal back following a swift move. With time running out, though, Merriman put the game to bed with a shot which squirmed through the grasp of the Chance keeper and into the net. Wilsons’ experience from 2016 taught them not to be complacent after their opening victory. Merriman forbade any food to be eaten from the BBQ until the group stage was complete. Thankfully, he had brought the team oranges. Farringdon Chambers were next up for Wilsons. 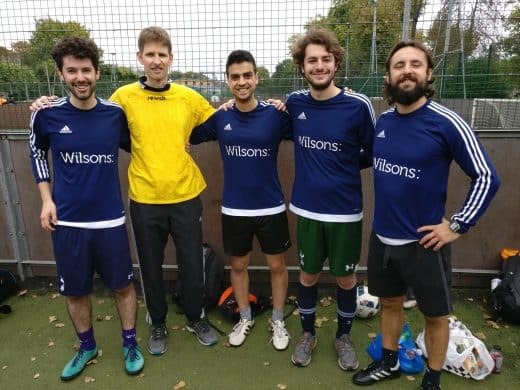 Having looked impressive in their opening fixture, a 2-2 draw with the London Criminal Courts Solicitors’ Association, Farringdon continued strongly against Wilsons, with some quick, incisive football. They found gaps in behind the Wilsons defence and only some wasteful finishing prevented Farringdon from running out more than 2-0 winners. Wilsons had only 15 minutes in which to regroup and rouse themselves for a double-header which would determine their fate. Group D was looking ominously like the Group of Death. Garden Court Chambers, always rock solid in the court room, had historically shown evidence of vulnerability in their Calthorpe Cup encounters with Wilsons. If Wilsons were to progress, this was a must-win game. Wilsons started tentatively, however, failing to recreate the cutting edge which had been present in their first game. They resorted to long shots which the experienced Garden Court keeper saved with ease. And Garden Court showed signs of nicking a goal themselves, Davies having to be alert to keep out a couple of efforts. The game seemed to have been settled in the space of a two-minute period, as Merriman stroked in to the net in identical fashion with precision finishes off the keeper’s left-hand post. But Garden Court were not finished. They struck back through a break down the left wing, with Davies deceived by a low shot which he failed to keep out with his legs. Finally, jangling Wilsons nerves were calmed as Merriman completed his hat-trick. The final whistle sounded, with Merriman sportingly declining to keep the match ball, as it was required for the next fixture. Wilsons too were required for the next fixture and they could have been forgiven for showing signs of weariness. But, pitted against the London Criminal Courts Solicitors’ Association, Wilsons set about their task with tenacity, producing a defensive masterclass which left the pundits stunned. Abbott and Ahluwalia at the back restricted LCCSA to a handful of chances, and Davies picked up his first clean-sheet of the tournament with a couple of vital blocks and a diving save to deny LCCSA at the back post. And just as the game looked like it could be heading for a stalemate, Merriman wriggled free and struck decisively into the net for his fifth and arguably most valuable goal of the day. 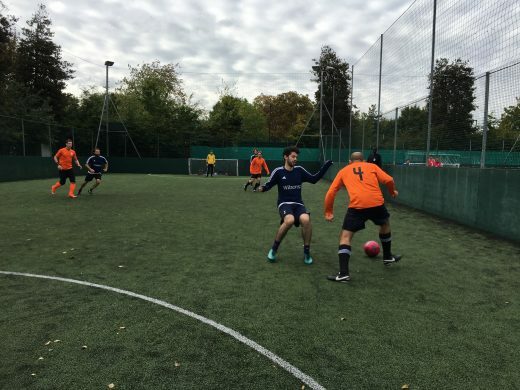 Wilsons clung onto their slender lead and the final whistle meant that Wilsons were through to the quarter-finals, as they could finish no worse than runners-up in Group D.
Attention turned to the game between Garden Court and Farringdon. After Garden Court scored, Farringdon looked like they might be on the receiving end of an upset. But Garden Court were cruelly denied their first point of the day after a Farringdon fightback was completed with a late, late goal. Wilsons would have to face the winners of Group C in the next game. Wilsons went into the quarter-final stages with the knowledge that they had not won a knock-out game in recent history, memorably going out on penalties to Team Somaliland and Team Rwanda B in successive iterations of the Waging Peace Trophy. But they came out of the traps flying against 2 Kings Bench Walk, the eventual winners of Group C. Tsigkas and Merriman fashioned chance after chance, with Abbott and Ahluwalia also getting forward as they sensed 2KBW were there for the taking. Wilsons were leaving themselves open at the back, but Merriman and Tsigkas tracking back helped to snuff out the half-chances 2KWB were creating. And just as it looked like 2KBW were gaining the upper hand, and Wilsons would be left to rue their missed opportunities, Ahluwalia struck a powerful shot which rifled into the net for his first goal of the tournament. Wilsons’ joy was short-lived. Moments later, 2KBW broke and a composed finish put 2KBW level. And when 2KBW added a second and a third in quick succession, there only looked like one winner. Wilsons, rattled, fired in a couple of long range efforts, but the 2KBW keeper was equal to them. And when a fourth goal for KWB went in, Wilsons knew that their knock-out hoodoo was to remain with them for another season. The Wilsons dream was over. Not so for group-stage conquerors, Farringdon, though, who went on to take the trophy and bragging rights for the coming year. Wilsons would particularly like to thank Joel Carter of Just for Kids Law for arranging such an enjoyable event, as well as Hodge Jones and Allen for their support of it. Wilsons: FC will be back.